Think you need weeks, rather than days, to do any bit of Oz justice? Not necessarily. I hopped over to Sydney via Doha on Qatar Airways for a total of one week – two days travelling, and five days exploring. That’s a decent amount of time to cover a city and its surroundings areas. Segueing seamlessly into the second part of this two part series – the first covering how to spend three days in the city of Sydney – this post deals with the remaining two days of the five I spent in this part of Australia. 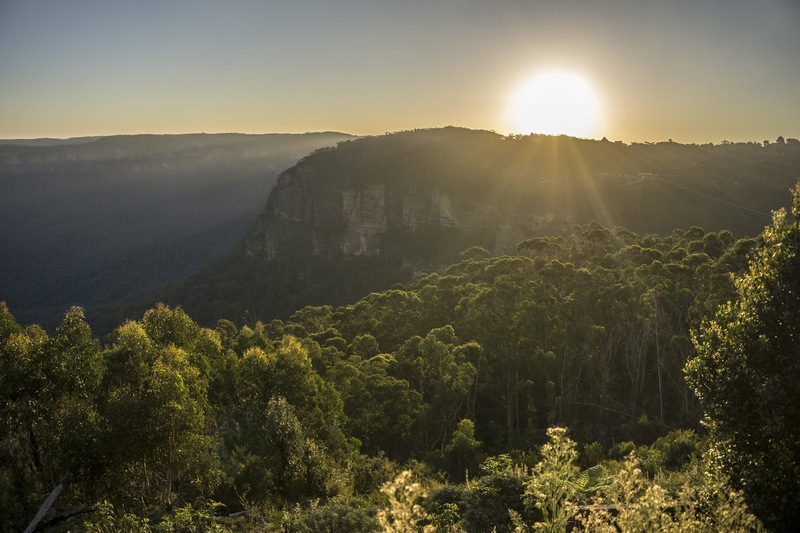 Less than two hours away by train or car and around 85km northwest of Sydney, you’ll find the slice of eucalyptus paradise that is the vast Greater Blue Mountains World Heritage Area, and one of the country’s most spectacular natural parks. 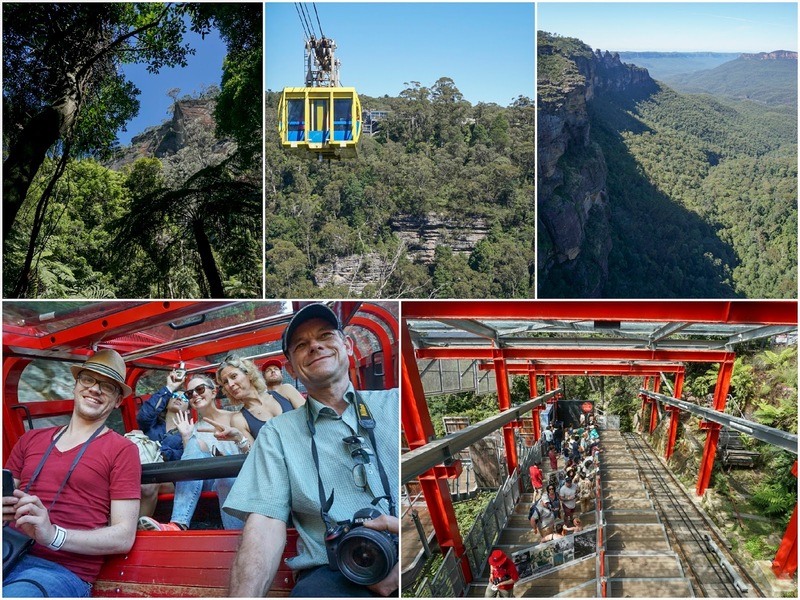 If you’re into the great outdoors, wildlife, nature and adventure, the Blue Mountains’ close proximity to one of Australia’s most popular cities, means a night or two there really can’t be missed if you find yourself in this part of the world. Scenic World in Katoomba (the chief town of the City of Blue Mountains) has quite a bit to boast about. It’s got the steepest incline railway in the world (that’s us in it in the picture below), the steepest aerial cable car in the Southern Hemisphere, and a 2.4 km pathway through rainforest that’s hardly changed since the Jurassic period, which also happens to be the longest boardwalk in the Southern Hemisphere. Add to that bristling panoramas of the wilderness, waterfalls, valleys and rugged sandstone tablelands, and the opportunity to explore ancient caverns and discover limestone crystal and underground rivers deep within the mountains, and you have the makings of the ultimate Blue Mountains adventure. And all this less than two hours from Sydney. What a treat. We almost bypassed this, as we’d spent the morning feasting on gorgeous views at Scenic World. But I’m glad we didn’t. 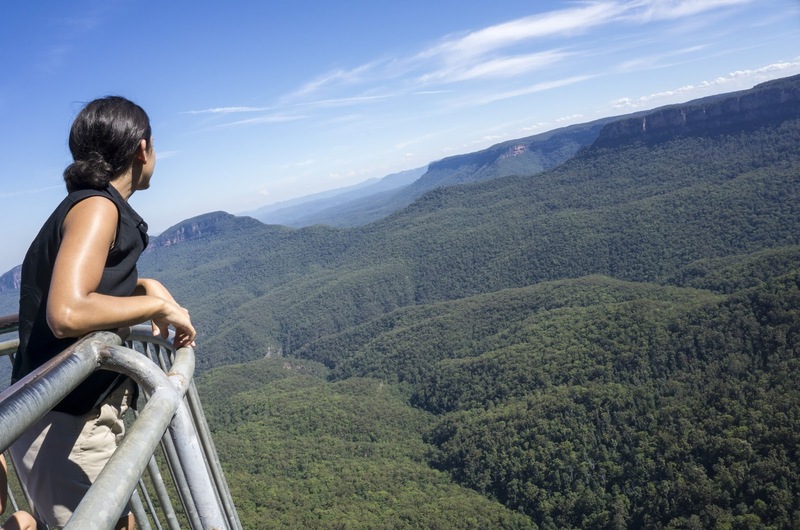 Perched on the edge of the escarpment, on the traditional land of the Gundungurra and Darug People, all that stands between you and eucalyptus forests fading into the horizon is a metal railing. Which makes for some fantastic and completely unobstructed photo opportunities. 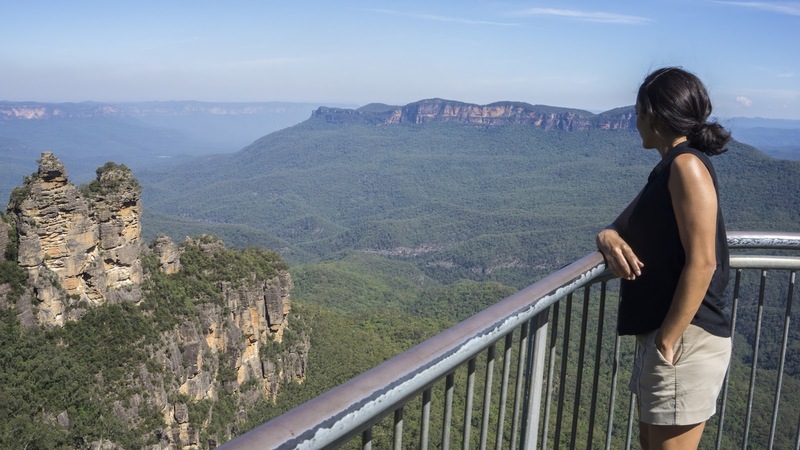 From this point you can see the southern Blue Mountains, Kanangra-Boyd Wilderness, and the storied Three Sisters sandstone rock formation from a variety of lookouts. You can also head down the path to the Three Sisters Walk, and for those after something a bit more taxing, take the 980 steps down the Giant Stairway to the valley floor. It’s also a great spot to appreciate how the area got its name. These immense forests are densely populated by eucalyptus trees heavy with oil. They fill the atmosphere with finely dispersed droplets of oil, which, in combination with dust particles and water vapour, scatter short wavelength blue light. This means on warm days, the whole area is cloaked in a blue haze. Very cool. More details about Echo Point on the Destination NSW website. Oh boy, did I enjoy this. 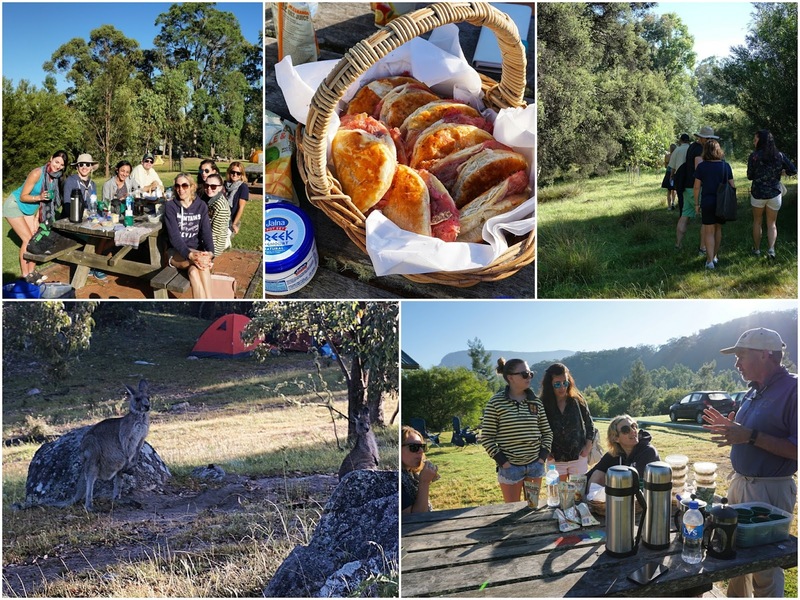 The hugely passionate Tim from Tread Lightly Eco Tours drove us into a remote part of the World Heritage area early one morning, to rendezvous with some kangaroos. Mist-covered wilderness, learning about wildlife and the Blue Mountains environment, spotting loads of wild wallabies and kangaroos – this was right up my street. I learnt a serious amount of interesting nature facts, which for a wildlife nut like me, I couldn’t get enough of. Did you know: kangaroos are the only animal on the planet to be permanently pregnant (bonkers reproductive process – look it up). They’re also the only animal on the planet to not have a gait i.e. they can’t move their legs independently, they can only hop (rabbits can walk, if you’re wondering). There’s a mind-boggling 22,000 species of fungi in the Blue Mountains, one of the highest concentrations in the world. It also has one of the highest counts of lightening strikes thanks to the conductive iron sand rock, and it’s that lightening that creates about 1000 bush fires a year. And Australia is the only country that has trees which drop their bark in autumn, instead of their leaves. I mean, I could go on. Tim also packed a breakfast for us to enjoy al fresco in the morning dew, including still-warm rhubarb turnovers made by his wife, yoghurt, homemade granola, and coffee. Really, it was a good morning. The Hydro Majestic is in fact one of the country’s most iconic and historical hotels. 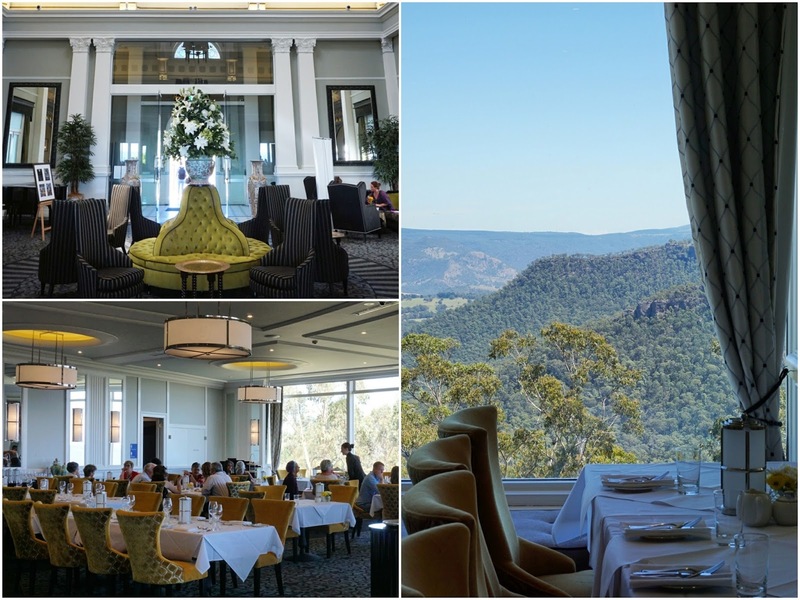 The Wintergarden is a popular dining option within the property, thanks to the sweeping views over the Megalong Valley. It’s here that people come from far and wide to enjoy a premium afternoon high tea, whilst gazing out the windows over the sensational surroundings. I appreciated the option of an Eastern High Tea, with steamed dumplings, crispy BBQ duck spring rolls, coconut chicken sugar cane skewers, twice cooked pork belly and a selection of eastern and western desserts, with the usual choice of tea or coffee. Particularly good if you’re from the UK where we’re spoilt with afternoon tea options, and you’re a bit jaded by the classic format. There’s no hiding this laid back and bustling restaurant was once a mechanic’s workshop; there’s timber, steel, stone and leather, with a vintage car-hoist used as a wine rack and plant pots made from stacked tyres. 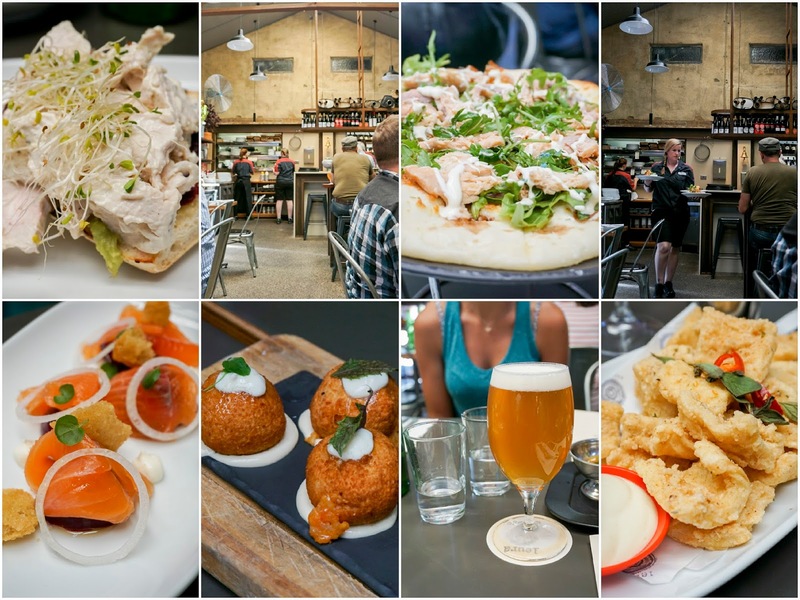 Leura Garage is about hearty and fresh food cooked simply, blending the best of city and country life, with a strong nod towards Italian cuisine. 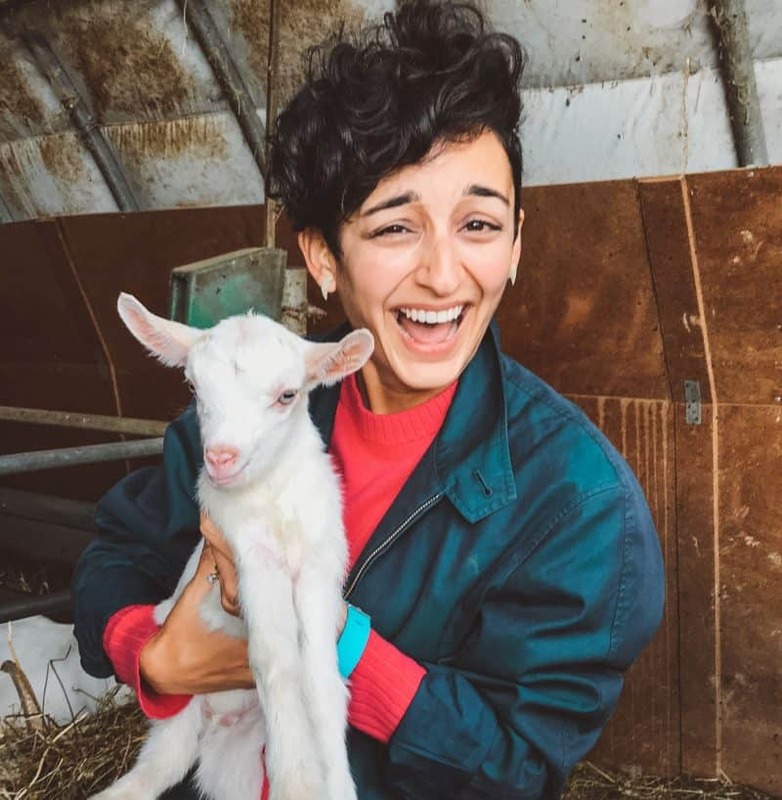 Expect the likes of big and bold salads, arancini and calamari, pastas with beef ragout or mountain mushrooms, roast lamb shoulder, and a range of pizzas. They also take their environmental impact very seriously, taking great pains to minimise their carbon footprint. A rainwater storage system holding 22,000 litres makes the restaurant self-sustainable for its water needs, and 100 square metres of solar panels on the roof help keep electricity bills at a minimum. Along with a host of other initiatives, it’s a beacon in eco-construction in one of the country’s most beautiful natural environments. Should you want to enjoy dinner teetering on the very edge of the Blue Mountains National Park, this is the place to do it. 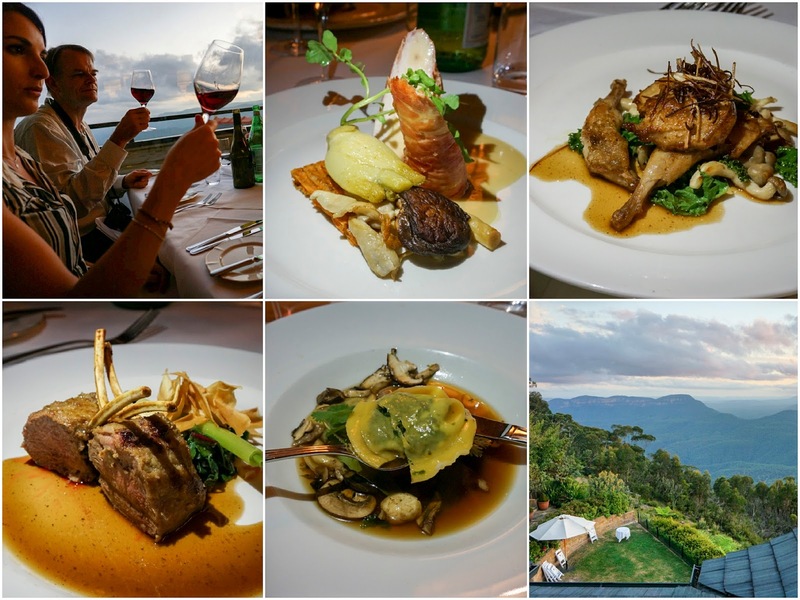 Outstanding views are a common theme when visiting this part of the world, and the ones from Echoes Restaurant boast cliff edges and lush rainforest valleys, right through the Jamison Valley to Mittagong, 80km away. The menu showcases modern Australian cooking with an Asian influence using local produce, and complimented by select boutique Australian and imported wines. Expect the likes of pan-fried quail with kale, shimeji mushroom and a tamarind and honey glaze, and chicken wrapped in jamon with sweet potato and quinoa rosti, braised fennel, wild mushroom and truffle velouté. 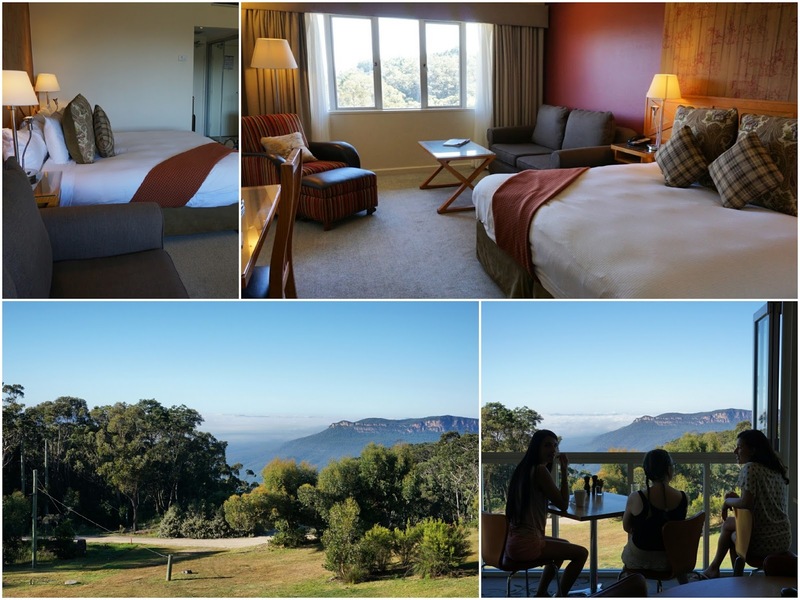 You’ll find Fairmont Resort in Leura, one of the most charming upper-mountain cities in the country. Incidentally, it’s also the only city in the world that is actually within a world heritage area. And it’s also the only city in the world that has managed to keep McDonald’s from opening a restaurant there, even if it does cost the local council $150k a year in legal fees. Keep up the good fight! Both things I learnt from Tim during our bush walk with him (above); told you he was a fountain of fascinating facts. Part of the prestigious MGallery collection, Fairmont Resort features 222 charming and spacious boutique-style rooms and suites, surrounded by Jamison Valley, and adjoins Leura Golf Club. It’s an upscale base from which to launch your Blue Mountain adventures. I’ve already covered the journey from London to Sydney on Qatar Airways in Part 1 of this two part series – do check it out. It was a joy. To get to the Blue Mountains from Sydney, you can drive the 90 minutes direct via the M4 motorway, or take the scenic route through the Hawkesbury along Bells Line of Road. If you’re catching the train, get the Blue Mountains Line from Sydney’s Central Station to Katoomba, and you’ll be there in just two hours. Note: This Sydney trip was hosted by Destination New South Wales and the flights by Qatar Airways. Thank you to everyone involved for a truly wonderful experience. I’ve been greatly missing Sydney since the moment I left.. All views remain my own, as always.